The Waterford Post Office is the third oldest in Loudoun after Leesburg in 1793 and Middleburg in 1797, was a tribute to the industry of the Quaker families who began settling the area around Janney's Mill in the late 1730s. 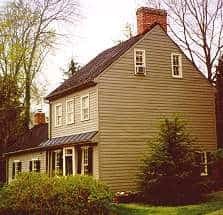 As early as 1809, Quaker Daniel Stone lived in the Hillside House on Bond Street and operated Waterford's first post office. The house remained in his family until at least 1875, when a map indicates his daughter Rachel Hollingsworth was living here. 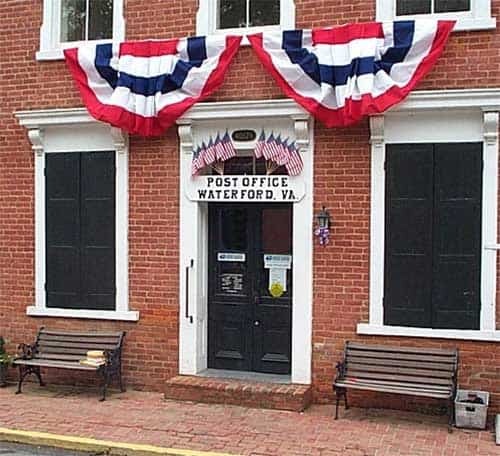 Currently the Post Office is located at the corner of Main and Second Streets and has been in this location since 1897. This circa 1880 building replaces an earlier brick one begun around 1812 that served first as a residence and later as a store. John Williams operated a store here for many years; in later years John B. Dutton (1816-1892), another Quaker, ran a store at this location. She did a noble deed. For more stories like these, purchase a copy of "When Waterford and I Were Young" by John E. Divine. Purchase your copy online or visit the Waterford Foundation office at 40222 Fairfax Street, Waterford VA.